How to make a flash short? 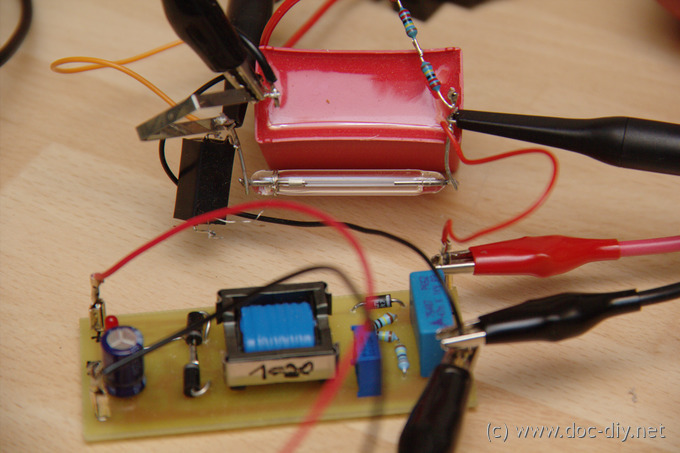 This article is a guide how to build a homebrew high-speed photoflash unit. Compared to commercially available devices this flash will offer a much shorter flash duration allowing to reduce the motion blur greatly. With about 2 microseconds flash time it's about 30 times 'faster' compared to a standard flash gun set to 1/64 output power. 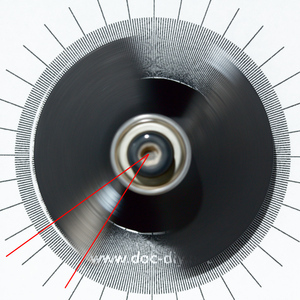 The difference is demonstrated in the two images below, where a router bit was photographed at 30000 rpm. 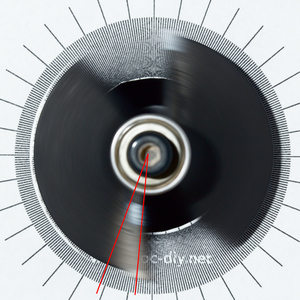 The presented project is intentionally kept DIY-friendly by using easily available parts and "low-frustration" technologies. The low tech approach also pays out if you need several units. Please note that the circuit is designed for 230 V and will not work properly in 110 V grids without modifications. There are voltages above 1000 V in the device. Make sure, you have enough experience with electrical circuitry if you plan to build the flash unit! where E is the energy given in Joule [J] (= Watt-seconds [Ws]), C is the capacity in Farad [F] and U is the voltage in Volt [V]. In the simplest case all electric energy stored in the cap goes into the flash tube after the ignition. The ignition starts when a high voltage pulse of about 4 kV is sent to the tube. To control the light output one could reduce the cap voltage according to the formula above, bypass (waist) some energy around the flash tube (quench tube) or interrupt the energy flow after a desired time. The fist two options are rather impractical because they discharge the capacitor completely each time. The long recharge time makes a fast sequence of flashes impossible. Option three is of course the most elegant one and the standard solution today. It became possible after the development of powerful semiconductors. Today the so called IGBTs are used to interrupt the discharge. They are a mixture of MOSFETs and bipolar transistors. The diagram below shows the light output over time for the common Canon Speedlite EX430EX at different output settings. This flash unit is specified with about 40 Joule flash energy. 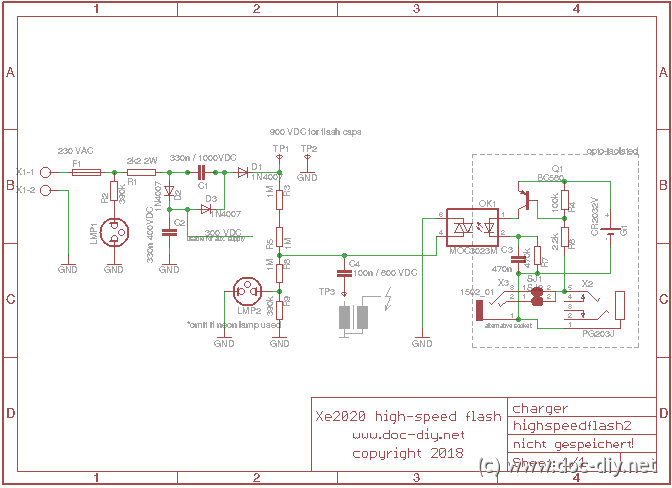 Assuming a working voltage of 350 V the flash cap should have something around 650 uF. 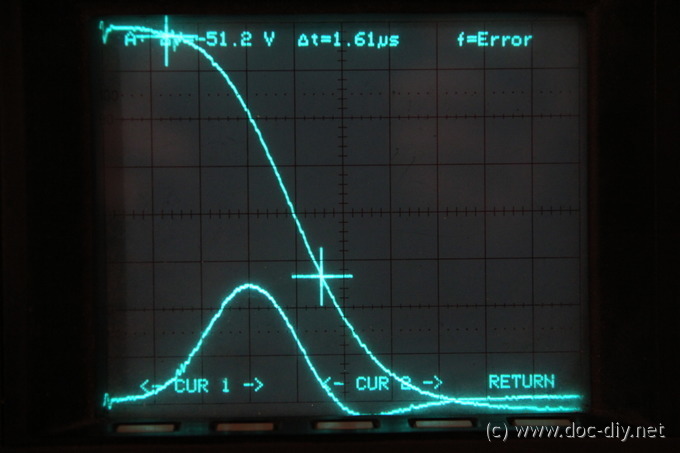 For all settings the light output follows the same curve initially but falls abruptly to zero after the current flow is cut after a defined time. It is clearly visible that the flash duration decreases quickly when the output energy is reduced. It spans between approximately 1/500 s for full energy (1/1) and 1/15000 s for the lowest setting of 1/64 (approx. 0.5 J). 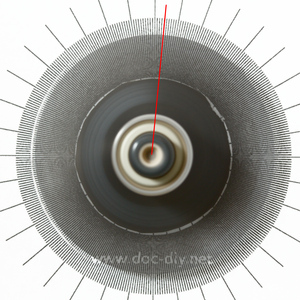 Therefore 1/15000 s is the number to be beat by the DIY construction, at more than 0.5 J light output if possible. There are two main factors to look at when trying to decrease the flash burning time. The less energy is stored in the photo flash capacitor, the shorter will be the flash duration. That's pretty trivial - just like in every battery operated equipment. This very simple method has the drawback of reducing the light output, so a trade-off between flash duration and light intensity must be found. To keep both values in a reasonable range, the parallelisation of multiple caps and tubes can be applied. The second important factor is the flash tube working voltage. 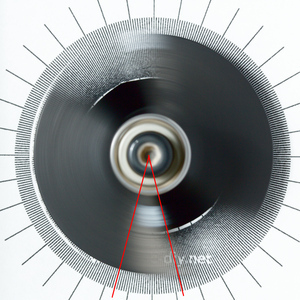 The increase of the voltage results in a higher discharge current and thus accelerates the discharge process. It's more or less Ohm's law: higher voltage means higher power with a constant resistance. Theoretically the working voltage could be increased to just below the self ignition voltage, but practically several limits exist. Too high voltages will stress the flash tube thermally over the limit and result in short tube live or even immediate damage. Secondly, the emitted light spectrum will shift towards UV lowering the daylight efficiency and disturbing the white balance. From the electrical point of view high voltages cause problems with insulation and the voltage ratings of the electronic components used. Caps with DC voltage ratings above 1600 V are hard to find and expensive. Stacking them in series requires lossy voltage dividers for equal voltage distribution across the caps. Note that scopes and multimeters are often limited to 1000 V, too. Finally a compromise has to be found. We are looking for a flash voltage which is significantly higher than the typical value of 350 V, but is still manageable by the tube and a single cap. The voltage of about 900 V seemed to be good value. The next step was to test how such a setup would work in terms of flash duration, durability, light colour, etc in reality. The test circuit is shown below. The red cap is a MKP10 metallised foil pulse type by WIMA rated with 1uF / 1000 VDC. 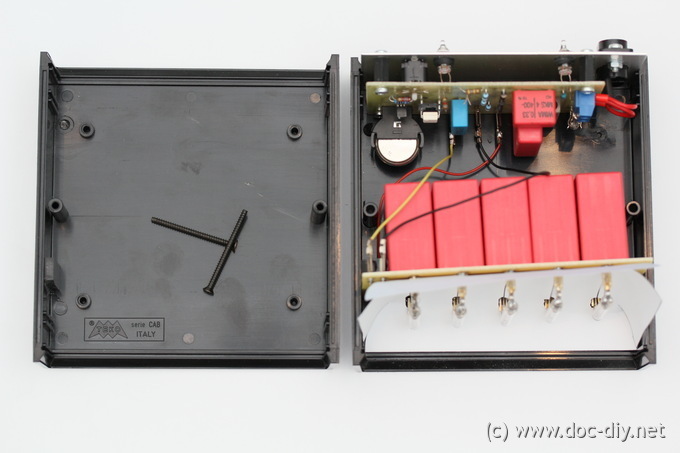 It's charged with a prototype flyback step-up converter (based on the LTC1624) going up to 1000 V. A high current shunt resistor with 30 mOhm is connected in series between the cap and the tube (U shaped part at left terminal of cap). The tube is triggered with a standard ignition transformer. The curves below show the cap voltage (falling curve) and the discharge current (bell-shaped curve) with 0.5 us/div on time axis. In the experiment the cap is charged to about 800 V (100 V/div). The current curve has its peak at about 840 A (10 V/div at 0.03 Ohm) resulting in a power dissipation of >500 kW. The discharge process takes less than 2 us. The wiggle in the current curve indicates some oscillatory behaviour. A possible explanation is an LC resonance of the cap and the shunt. Raising the voltage to 900 V and the omission of the shunt resistor should result in even better performance. Paralleling five caps and tubes will result in a flash energy of E = 0.5 * 5e-6 * 900^2 = 2 Ws. Both the energy and the duration outperform the standard flash gun significantly (at 1/64 power). Success! 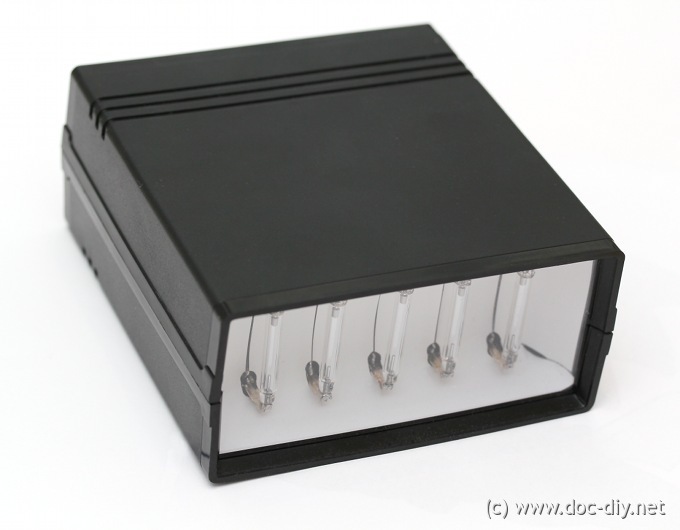 For most electronic projects the enclosure and a nice mechanical finish is just an option. In case of a flash unit it's an absolute must. The risk of touching any electronic parts has to be avoided under all circumstances like rough handling or contact with unskilled users. This is why the mechanical integrability question was the starting point of the design. I decided to split the whole circuit into two parts for more flexibility. The parts are: The high voltage charger and the lamp with the tubes and the caps plus the ignition transformer. 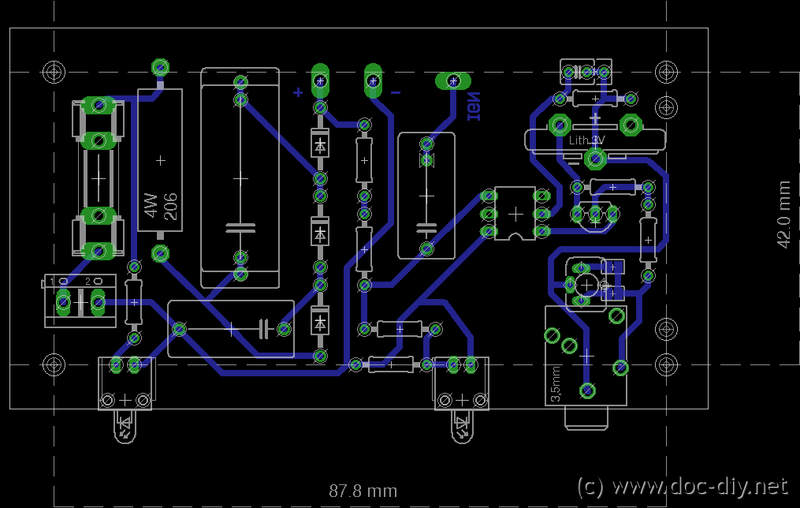 Both parts reside on separate PCBs and can be designed more or less independently. They are described in detail in the following. The task of this sub-circuit is to charge the photo flash cap to a desired voltage. The most common charger types are the flyback converter found in battery powered flashes or the direct mains charger seen in stationary equipment. Both types are potentially good candidates for this project. Let's have a look on the pros and cons of both topologies in the table below. Although the flyback version is technologically superior, the direct mains charger seemed more DIY-friendly to me, especially when building several devices. The required exotic flyback transformer tends to be a DIY bottle neck and no fun when it comes to troubleshooting. I went for the mains charger. The core element of the charger is a voltage tripler - a circuit probably dating back to the pre-semiconductor era. Based on a ladder of diodes, the AC from the mains is tripled to about 900 V. For 110 V grids more stages needs to be added to achieve the same voltage. 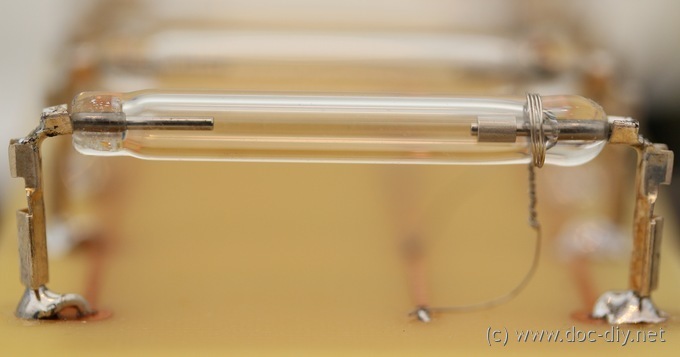 A resistor voltage divider (multiple resistors because of HV) reduces the voltage to about 300 V for the ignition cap C4 and the neon bulb LMP2. The neon bulb serves as a 'fully charged' indicator. LMP1 is a general ON indicator and just optional. The charging takes about a second, depending on the components chosen. The ignition is triggered with an opto-triac. It discharges C4 through the ignition transformer converting the 300 V pulse to about 4 kV for the tubes. The low voltage part is galvanically isolated from the HV side by the opto-triac. A lithium coin cell (common 2032) provides the current for the emitter diode in the opto-triac. When the line is pulled down at the jack socket, the PNP transistor opens. Cap C3 is then charged suddenly causing a current peak in the IR diode. The charge-pulse triggering gives a short but strong current pulse. 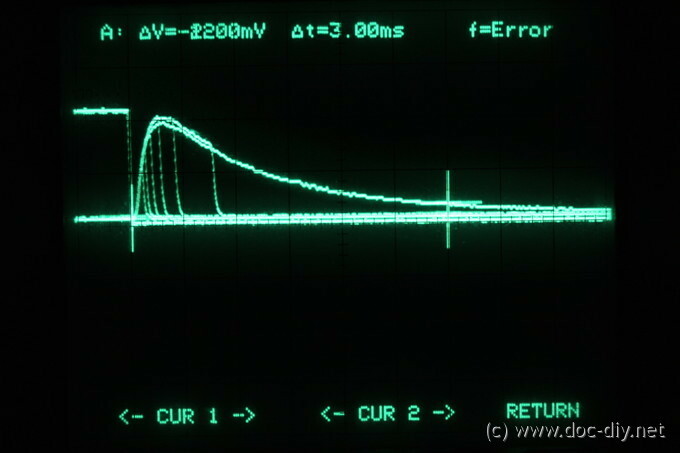 This results in a better triac timing compared to the classic batter-resistor-LED circuit. Resistor R7 discharges the cap to make it ready for the next firing event. It would be blocked otherwise. This part contains the caps, the ignition transformer and the xenon tubes. It's separated from the charger for more flexibility. There are just three wires connecting the charger and the lamp: ground, cap HV and the ignition transformer line. The HV ignition lines of all five tubes merge on the PCB with the transformer HV output. The peak currents during a flash reach easily >600 A. 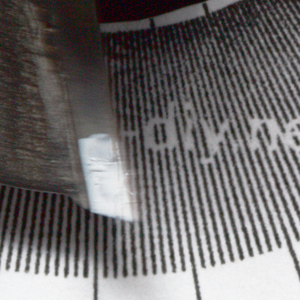 Keeping the lines to the cap terminals short is a good idea. The caps are five WIMA MPK10 1uF / 1000VDC-600VAC. More details on caps are given later. Soldering the tube terminals needs some care, but 10 of 10 joints went fine. I have soldered the xenon tubes to removable connectors being afraid of frequent damages, but wouldn't recommend it now seeing no failures at all. 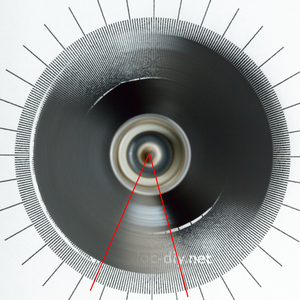 The reflector behind the flash tubes is made of paper since, most reflective materials or coatings are conductive. It has the advantage of giving a very soft diffuse light at the price of low (no?) directivity. Make sure the lamp circuit is covered with a window blocking the contact with the high voltage. I used cheap flash tubes found at www.pollin.de in a pack of 10 pieces for a couple of Euros. The test tube survived 10000 ignitions without problems. As the tubes are working far below their rated power of about 20 Ws their quality seems not to be essential. The most critical task is probably finding flash tubes of the right size. For the enclosure and PCB shown above the over-all length should not exceed 46 mm. Using five equal tubes is recommended to avoid currents flowing between the tubes. Well, that's difficult. Unfortunately I didn't test different types with respect to durability and flash duration. Any proven information on this is welcome! So my choice is based more on intuition. As mentioned above I excluded electrolytic caps from my choice. Generally the type selection is a trade-off between durability, high peak current and size. I went for the best MKPs I could find and used the MKP10 by WIMA. The M in MKP stands for metallised foil. The next level are FKPs with copper electrodes instead of the foil. The price to pay here is a worse capacity/size ratio or less light output for the same size. Note that there are big differences between the MKP types. Try to use caps explicitly specified for highly pulsed currents. Other Mxx types like MKS or MKH not designed for high currents and should not be considered. 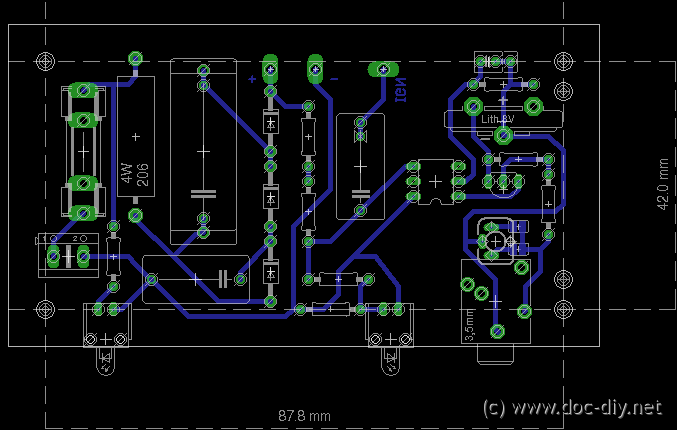 The maximum area occupied on the PCB should not exceed 48 mm x 21 mm for the presented design. The depth is not critical. Here I tried two devices which fulfilled the voltage specs. The PC3SF11 by Sharp didn't survive long for reasons I don't know. It broke after a few flashes. Probably the current peak of the ignition cap or the transformer kick-back voltage were just too high. The MOC3023 passed the long time test without any issues and can be recommended. When using an other device, be sure it has no zero-cross circuit. Such devices are designed for mains applications and will not trigger with the constant voltage across the triac. 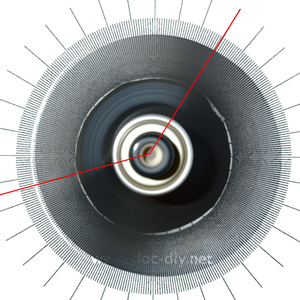 Using a socket (DIP6) might be a good idea as some 'material wear' is possible. They have a rather relaxed job. Just watch the voltage specs. The second cap C1 works with 600V, so pick a 1000VDC type. The capacity values are not really critical, but affect the charge time. A value of 330nF for both caps will charge the 5uF to 900 V in less then a second. Choose a smaller capacitance if space is limited. 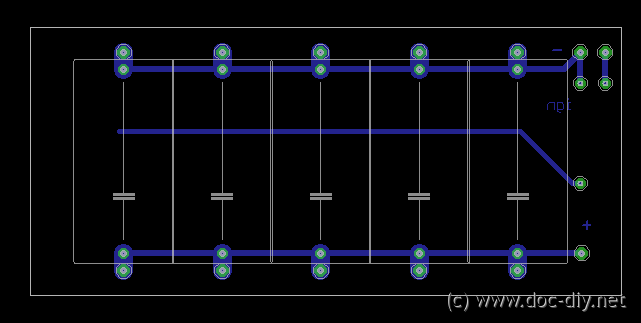 The PCB has two options for the trigger signal socket: vertical and horizontal. Please note that the vertical jack socket needs to be soldered on the "wrong" side of the PCB. , be sure to have a possibility to reach the pins with the soldering iron. Solder elevated if necessary. Any pulling force will go directly on the pads which might detach. Neon is neon, use whatever you find. There are also green neon bulbs which look cool. The ignition transformers don't have names usually. Use whatever you find. The Eagle (very old version) files are available for download below, so you can easily adjust the dimensions to your needs. Diagrams and formulas are nice, but let's see how the final outcome looks in real pictures. 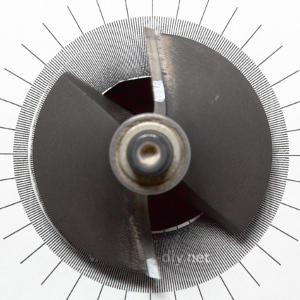 The easiest setup to demonstrate motion blur are images of a fast rotating device. Compared to linearly moving objects it's much easier to capture because of the periodic movement. After checking different tools for the highest possible moving speed I picked a router (woodworking). Although the maximum cutter diameter is rather small, with 30000 rpm it gives the highest diameter x rpm ratio of all tools I had at hand. 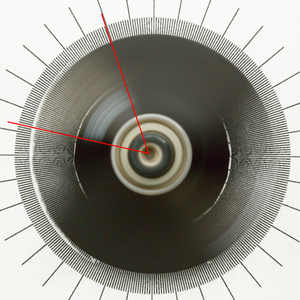 As shown below, the machine was mounted to a plate with a fine angle pattern. The measurements were made in dark condition. The flash units were triggered manually, while the camera was set to bulb exposure. The pictures show the results for the Canon Speedlite 430EX with different output power settings and the high speed flash at the end. Taking these shots was definitively my noisiest photographic job. A noticeable reduction of the motion blur can be seen in the last image taken with the presented Xe2020 high speed flash unit. The following table summarizes the findings in numbers. The flash duration could be lowered by a factor of about 30 compared the to lowest energy setting in an of-the-shelf flash while the energy output has been increased by a factor of about 3. The flash energy of 2 Ws and flash duration of 2 us are the origin of the numbers in the project name. Good idea, nice work! Congrats! I will build this project too.